Greetings and Happy Holidays from Mrs. Mac and her Munchkins! 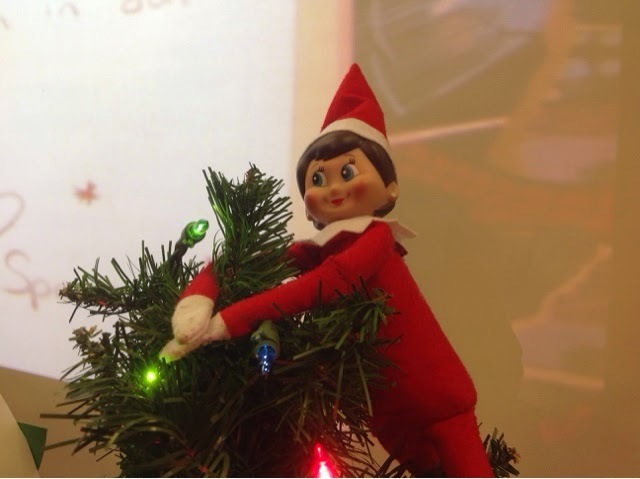 Our adventure began with our sweet, beautiful, and loving class Elf, Sparkle. Sparkle is a foreign exchange elf from the North Pole, sent to us by Santa, himself! As you can see, Sparkle really gets into all of our lessons, especially story time! The kids love her and she became part of our class family. As it happened, we were right in the heart of our Gingerbread unit when Sparkle started having flash backs from last year's Gingerbread Fiasco! It's difficult to talk about, but Sparkle had gotten tied-up by some pesky gingerbread men. She was so traumatized by these cookies that she no longer enjoys listening to their stories, so she made a sign boycotting Gingerbread Week, and even went to the extreme of hiding all of our Gingerbread books! The kids were worried about her, and they assured her that they would do everything they could to protect her this year, but just as Sparkle began to feel safe and sound…tragedy struck! Despite our class efforts, the Gingerbread Kids ran away again, and Sparkle, being the kind friend that she is, tried to stop them, only to find herself tied-up AGAIN! 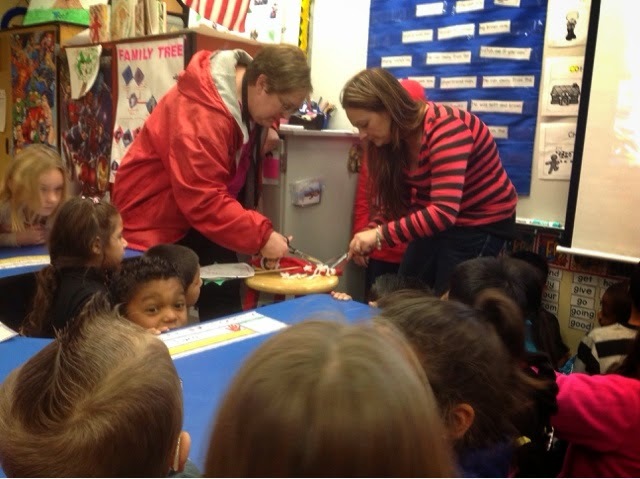 It was a very exciting moment when we realized that our ability to read could actually save elves' lives... and you'll be happy to know that our Gingerbread friends were found, and Sparkle was safely cut free. So the real story begins one brisk morning when I discovered a referral on the floor of my classroom. It was accompanied by Sparkle's "No Gingerbread" sign, some cookie crumbs, and an empty bag of gingerbread cookies. 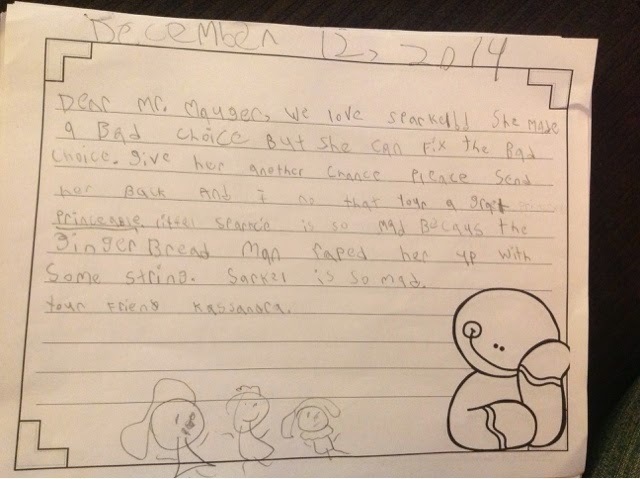 As I leaned in to read the referral, I discovered that it was from our principal, Mr. Mauger. He had apparently walked in on a horrific sight…. Sparkle EATING her gingerbread friends!!!! Now, we are a very close school family at Cottonwood Elementary and we don't require a ton of rules to remind us to do what's right. In fact, we live by the magnificent 7 Guidelines and the Rachel's Challenge program, and neither, in any way, shape, or form, allow for eating our friends! The unfortunate situation left Mr. Mauger little choice but to take Sparkle down to his office for an 'in-house suspension' until further notice. "Sparkle needs to solve problems without hurting or devouring others..."
Now Sparkle's referral may seem unfair in the real world, (as after all, gingerbread cookies are for eating!) but if you are open to the world of: magical elves living in your classroom for the month of December, cookies running away from your students, and Polar Express trains pulling up to your classroom door to drop off bells, cookies and hot chocolate.... then we must uphold the unwritten rule that we even if cookie friends get us mad and tie us up, we should not retaliate by eating them…right?…right! "I'm going to have to call Santa about Sparkle's behavior"
The looks on their faces were priceless! 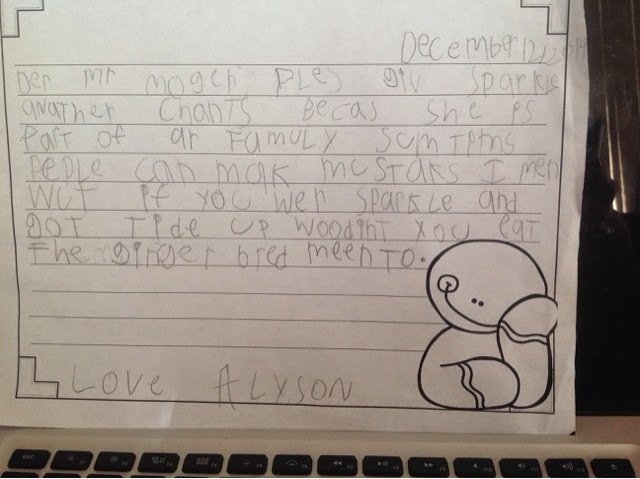 Because our principal is a very reasonable man, he told the kids that he would consider allowing Sparkle to come back if they could put "in writing" why Sparkle did what she did. Once he received something in writing and had a chance to speak with Santa about the situation, he would make a final decision. For the kids, this was, without question, their most important assignment ever! 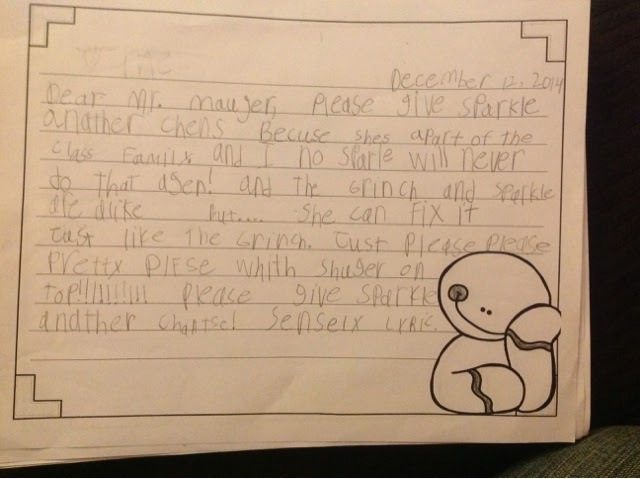 They would need to use all of the writing skills they'd acquired to persuade our principal to free Sparkle! If they failed, Sparkle would spend the only holiday they would have with him in Mr. Mauger's office! The kiddos were confident, however, as they knew that their writing skills had developed greatly in the past few months, and so, without wasting a moment, they began the task of putting into writing all of the reasons why Sparkle should be freed. The letters they wrote are absolutely ADORABLE! They were written from the heart.... and with the Secret Stories, they did so with ease! No "sticking-to-sight-words" for these guys! They were on a mission to save Sparkle and did not shy away from big scary words! Instead, they tackled them head-on using the Secrets to sound them out and say exactly what was in their heads that they wanted Mr. Mauger to know! "Sparkle can fix it, just like the Grinch"
"Sparkle was just mad because the gingerbread men 'raped' her up with some string..."
"What if you were Sparkle and got tied-up? Wouldn't you eat them too?" After the kids finished up their letters, I sent them directly to the office for Mr. Mauger to read. 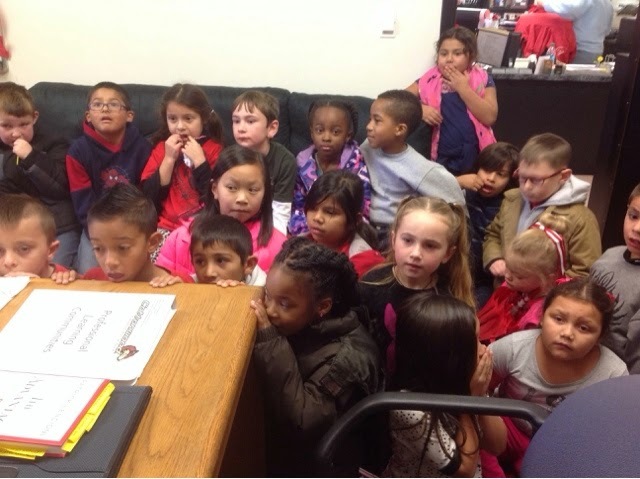 The kids eagerly awaited their appointment with Mr. Mauger at 11:00 that afternoon. Oh the look on their faces! So we all settled (i.e. squished) into Mr. Mauger's office and prepared for our meeting. Now as probably know, Santa is crazy-busy and nearly impossible to get a hold of this time of year. However, as you may not know, school principals have a "special line" that they can use for emergencies... and this definitely qualified! So Mr. Mauger was able to reach Mrs. Claus, who apparently was handling all of the "behavior business" that particular day. Mr Mauger had apparently been so impressed with our letters that he'd decided to read them to Mrs. Claus! 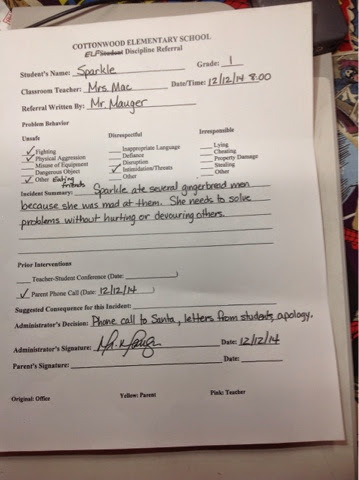 You can see bits of our principal's conversation with Mrs. Claus regarding Sparkle's inappropriate behavior, below. You could have heard a pin drop during the phone conversation with Mrs. Claus. 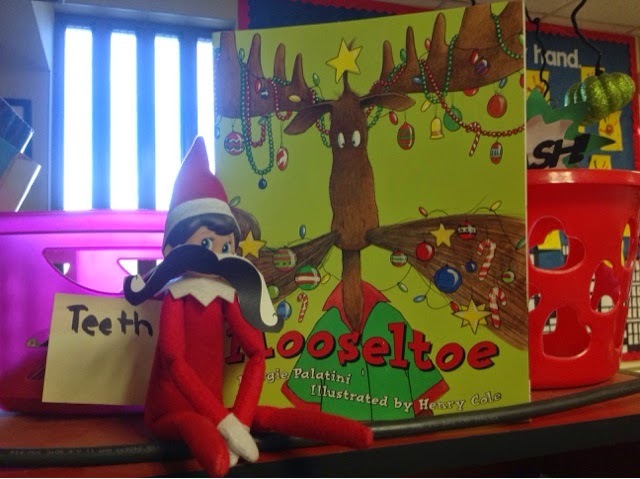 Finally, after a long conversation with Mrs. Claus, and careful review of the kids' heart-felt documentation regarding the reasons for Sparkle's poor choices, Sparkle was given another chance and was able to come back to our classroom for the remainder of December! The kids were so proud of themselves and so happy they could help a friend. Through their writing, they were able to give Sparkle the Elf a voice and save her holiday! 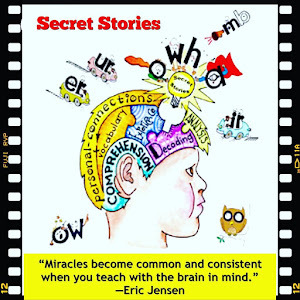 I hope you enjoyed hearing about our unusual holiday writing adventure, as it's part of my attempt to incorporate Common Core-rich lessons, while still including a little holiday magic! With a supportive principal, amazing kiddos, and the Secret Stories under our belts, anything is possible! Thank you to Mrs. Mac and her brilliant munchkins for this wonderful holiday post! Now if this doesn't take the cake for the sneakiest persuasive writing lesson EVER, I don't know what would! What a fun and engaging way to motivate young writers... using 'real-world' (well, kind of ;) experiences that are personally meaningful to learners! 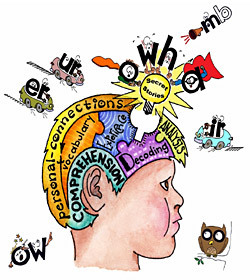 This is the perfect recipe for both developing and reinforcing these beginning skills sound skills for reading and writing! Thank you to Mrs. Mac & her Munchkins for sharing your fantastic adventure with us! I'd love to get in topuch with Mrs. mac to talk with her about how she set up "Spakrles" the Elf and how the problem with the gingerbread men came about to begin with. Is there a blog or another way I can contact her? Hi Katharine! I would love to chat with you about Sparkle. Target is a good place to start when looking for your own elf. Santa does a great job keeping the elves in stock there. These elves are called, "Elf on the Shelf". They come with their own story book explaining all about their magic. 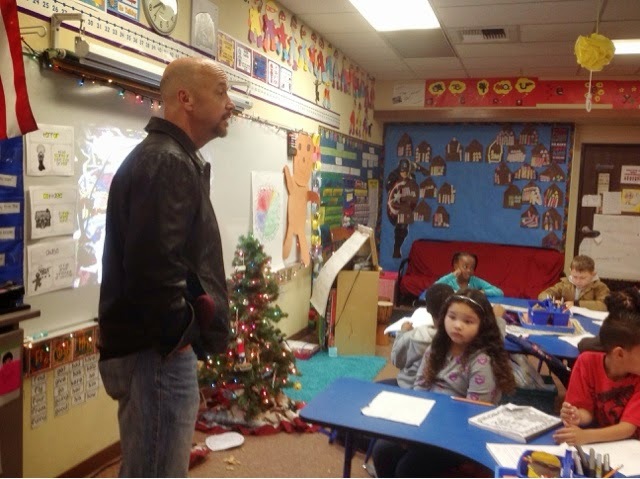 After introducing the story, the kids get to name their elf and then the fun begins. Every day your elf watches the kids to see how they are behaving, then at night, they fly back to the North Pole to report to Santa. 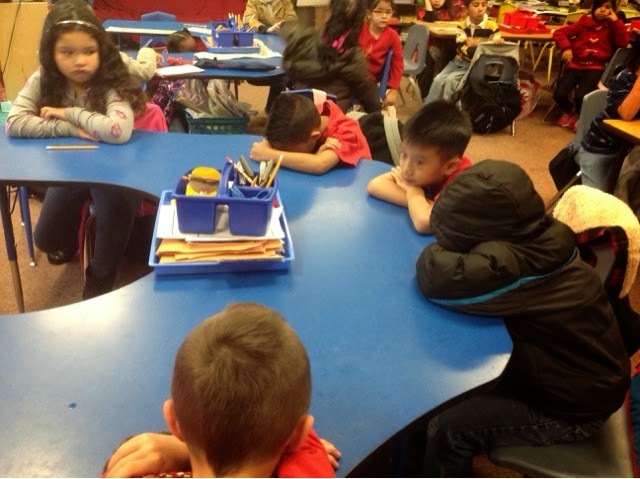 When they arrive back to your classroom, they always land in a different spot. This way the kids know for a fact that she "left" and came back. I have an elf at home too and my own children love him so much, I knew that I wanted to incorporate an elf in my classroom. I knew that I would want to sprinkle an educational twist with our elf so I needed to get creative. When Sparkle would come back to our school each day, she would bring books, math problems, or do something silly each time. I always linked in a standard because I am the sneakiest teacher alive. ;) I mean we can't let the kids know they are learning this close to Christmas. LOL!!! I loved involving Sparkle with as many lessons as possible. This way the kids would get so excited about wHAT they were learning that day. I mean everything is more fun when your class elf gets involved. The gingerbread man activity was just one of many silly ideas that popped into my head. I also knew that I wanted to include my principal in on the fun. He luckily supports my "out of the box" thinking. I don't have my own blog yet. I am very lucky to have met Katie, who allows me to stalk her ( I mean follow her) and sneak on her blog when my kids do something super special. I do however have a class Facebook page. I update it weekly with our silly adventures. You are welcome to "like" it. My page is.... Mac's Munchkins. My profile pic is me in sunglasses and a red shirt. I hope this answered your questions. If you have any other questions or just want to bounce something off me, please feel free to do so. :) I am always willing to have my brain picked. Thanks so much. I will let her know that you've posted this so that she can respond, as I'm sure others would have the same question. I love you blog! ANY student in your class MUST feel special. Where is Cottonwood Elementary?